Now that we know a new version of GoldenEye 007 is heading to the Wii, we can start preparing to play it in style. Peripheral manufacturer dreamGEAR has just the thing. dreamGEAR was not on my list of E3 appointments, but as sometimes happens at shows like these, I caught the eye of a PR rep and was trapped. Making the best of it, I perused their selection of odd Wii controller add-ons, iPhone accessories, and PlayStation 3 controllers. All interesting enough stuff, but then a glint of shiny gold caught my eye. 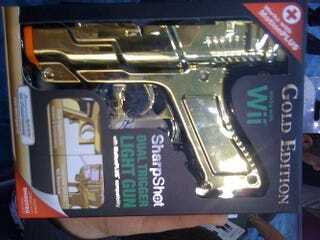 The Gold Edition SharpShot is the shiny, metallic version of dreaGEAR's standard Wii gun controller. Sure, it's just a plastic housing with Wii Motion Plus support, but it seemed like the perfect accessory to complement the coming Wii revival of the man with the golden gun. The Gold Played SharpShot is available at the dreamGEAR website right now for $24.99.